AP Mega Menu is the FREE WordPress plugin which allows you to add widgets columns on horizontal as well as the vertical mega menu. 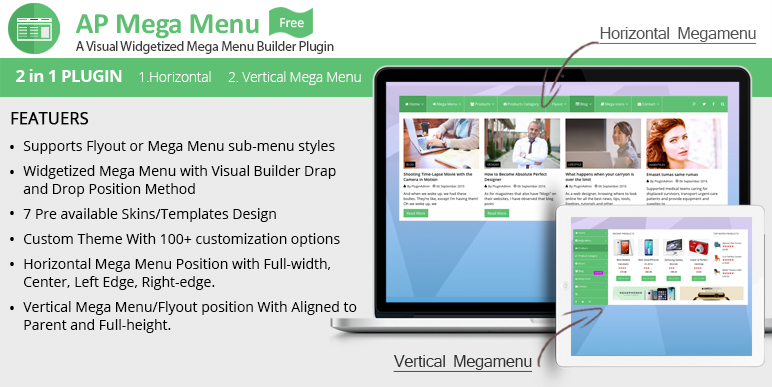 It is a built in visual mega menu builder plugin with features to display menu as the fly out or mega menu with vertical or horizontal orientation. Create multiple Mega Menus on the same page using short-code at the places you want to display. You can choose from the 8 free beautiful per-designed skins or you can custom design your menu bar as well with multiple options of the plugin. Configure Menu wise settings from admin navigation page. – 8 Free Available Skins/ Templates beautifully designed or custom design with multiple options. – You can set specific menu as flyout or mega menu for its sub menu with different styles. – Simply select widgets and drag, drop widgets with visual builder techique and you can also sort selected widgets in different position, increase/ decrease column width, also you can choose maximum of 8 columns for each mega menu settings. – You can choose specific menu location with different orientation such as horizontal or vertical menu type. Multiple Menu Icon with 300+ FontAwesome, 160+ Genericon and 100+ Dashicons available. -You can enable/disable top or bottom extra content for megamenu type with options to add Single Text, upload image from media library or simply add html content. – If the pre-available templates don’t work as per your site layout then you can even build your own custom template with multiple styling options according to your choice. – Display Search form on hover/click simply by using provided shortcode. Two types of search shortcode with inline left/right or megamenu type. Free AP Mega Menu Contact Information Widget provided as per designs. Hey Buddy!, I found this information for you: "Mega Menu for WordPress – AP Mega Menu". Here is the website link: https://access-keys.com/wordpress-plugins/ap-mega-menu/. Thank you.